Rosie was hanging out in her lab when two very eccentric men burst through the doors. They were time travelers, and they needed her help with an important part stuck under their time machine. How would they discover the shape? Would they fix the machine before they were stuck in this time forever? 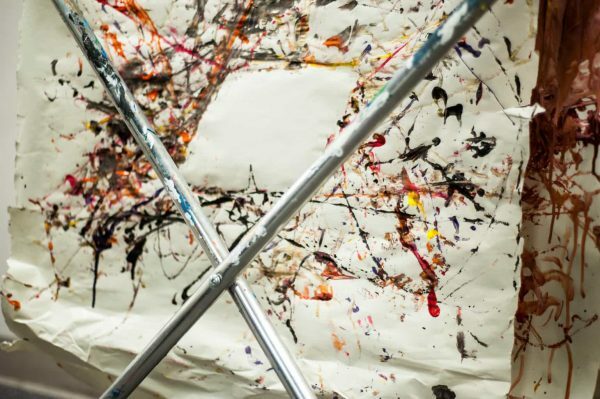 And…and is that Jackson Pollock?!? 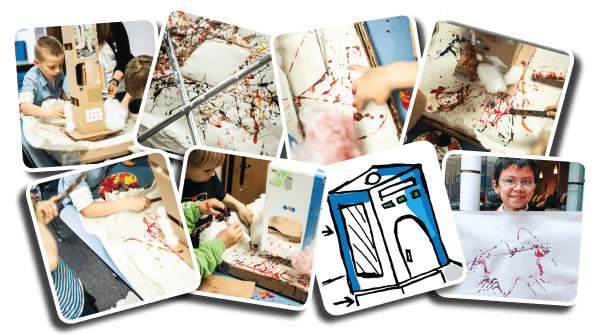 This fun science lab takes us on an adventure through forces, motion and particle physics. Discover how particle physicists discover new molecules as you and your kids discover the shape hidden under your time machine. This lab has so much art and mess in it your kids won’t even know they are learning about physics, forces and motion! 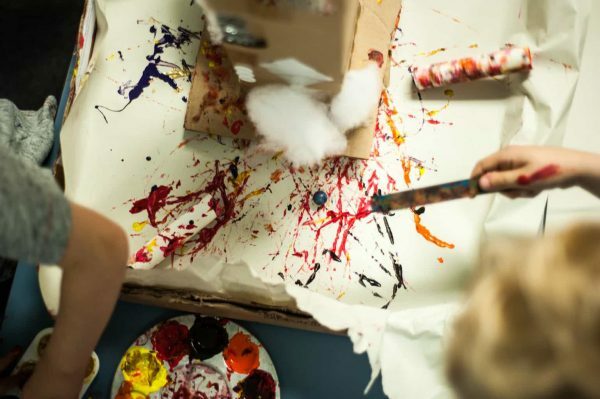 Design your own time machine, roll up your sleeves and fire off some paint covered marbles, and save the day. 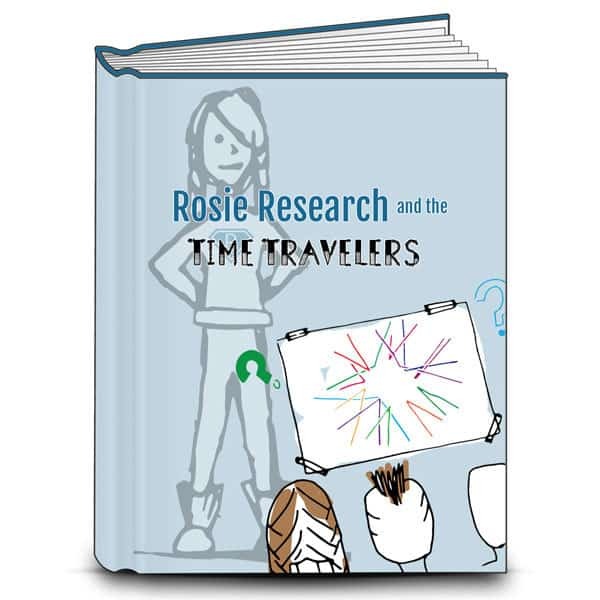 In this lab Rosie has some very lovable time travelers in desperate need to get back to their own era! Unfortunately a very important piece to their machine got lodged underneath their machine and they can’t figure out the shape of it to make a replacement! Can the team use forces, motion and concepts in particle physics to save the day? 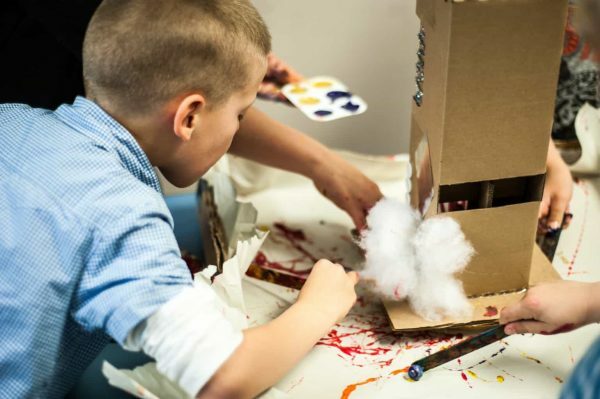 In this month’s lab your kids will get a chance to dabble in particle physics, learn about molecules in our add on activities section, discover forces at the playground, and explore the world of artist Jackson Pollock. There is one lab book for our Time Travelers lab and lots of add on activities to help scale it to your child’s age and interest! Tabloid versions of the labs are available if you want to print the labs on 11×17 paper to make each lab into it’s own folder. We also have half page sized labs to print on 8.5×11 and fold into a booklet – a format my six year old enjoyed more than the full sized format! Particle Animals: Look at real particle decays and shape them into your own animals to add into the particle zoo! The Particle Zoo: See data from a real life bubble chamber showing how subatomic particles decay, and turn those tracks into fun and quirky animals! At the Park: For younger kids, learn about forces on the playground, what activities use pushes? Which one’s use pulls? Are there any that use both? Zip into the Atom: Learn what makes up an atom as you create pom pom atoms from our periodic table! Zip into the Atom (Candy version): Dig deeper into the atom and see how protons and neutrons are made of even smaller particles called quarks! There are written parent teacher guides that will give you some quick tips and tricks to troubleshoot issues you might run into, tell you the broad takeaway from the lab, help you brainstorm questions to ask and some additional resources! Check out the Parent/Teacher video of Dr. Erica doing the lab here! The scaling guides will help you think of ways to expand on the concepts in age appropriate activities, while the sourcing guides will help you find everything we bought for the lab! Lastly there is our In Real Life download. This download will help you connect the concepts we work with in the labs to everyday life. It will help you guide your kids to understanding why optics is important and what the big takeaway of the lab is as well as safety precautions! Worried about knowing the science behind the mystery? Check out our parent teacher videos online to see the full lab as we answer a variety of questions you might have!